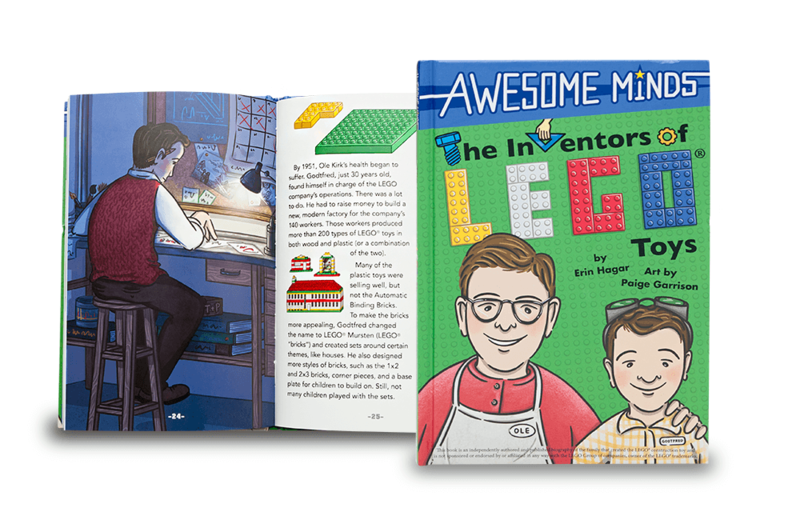 The children’s book Awesome Minds: The Inventors of LEGO® Toys is colorful and engaging, just like LEGO bricks themselves. Over the course of 48 pages, author Erin Hagar teams with illustrator Paige Garrison to tell the origin story of the Danish company behind the iconic toy. Hagar’s history lesson begins at the turn of the 20th century with Ole Kirk Christiansen. A carpenter by trade, Christiansen founded The LEGO Group in 1932 in the small Denmark town of Billund (where LEGO’s head office is still located today). The company initially developed wooden toys, including yo-yos, and became a family affair – all four of Ole Kirk’s sons worked there. The Great Depression and several factory fires eventually saw the company move away from wood and turn exclusively to injection-molding and plastic toys. The first glimpse of LEGO as we know it today came in 1949 with the release of Automatic Binding Bricks, which came in four-stud and eight-stud sizes. The bricks were largely ignored by the market while other plastic-based toys, like “Trackto” – a plastic tractor model that children were required to build before it could be played with – sold well. By 1951, Ole Kirk’s son Godtfred was in charge of the company and presided over several key decisions that spurred the company on its path to success. Several different sizes of LEGO bricks were created, and all sizes were redesigned to allow them to snap and stay together more easily. These design changes were eventually patented in 1961. The final piece of the puzzle was the development of LEGO systems that were capable of being interconnected with one another. The first “system” from The LEGO Group was a Town Plan that included individual sets for houses, factories, shops, and accessories like trees, vehicles, and street signs. The rest, as they say, is history. With demand for LEGO bricks increasing, the company eventually stopped producing all other products. The 1960s saw the introduction of the LEGO wheel, allowing for movable creations, as well as the introduction of motorized components. Highlights from the 1970s include the first LEGO people and DUPLO – oversized bricks aimed at preschoolers. As a result of all this innovation, the LEGO Group has grown to become one of the top toy companies in the world. LEGO bricks have become ingrained in popular culture, and LEGO sets enjoy an estimated five billion hours of playtime each year. Cereal: Snap, Crackle, Pop Culture from author Ed Daly is a humorous look at an industry that, despite recent downturns in sales and on-going health questions, remains a multi-billion dollar business in North America. WishbookWeb documents over 25,000 pages of Wishbook content from retailers that go back as far as 1937, allowing readers to look back at the toys, housewares, and apparel that once inhabited our material lives.